No. 1 topic for organizations: "What is the status of software-defined networking? Should I consider SDN?" The emergence of software-defined networking from the domain of service providers, test labs and proof-of concepts into mainstream enterprise datacenters is evident in a new Magic Quadrant report from research firm Gartner Inc. 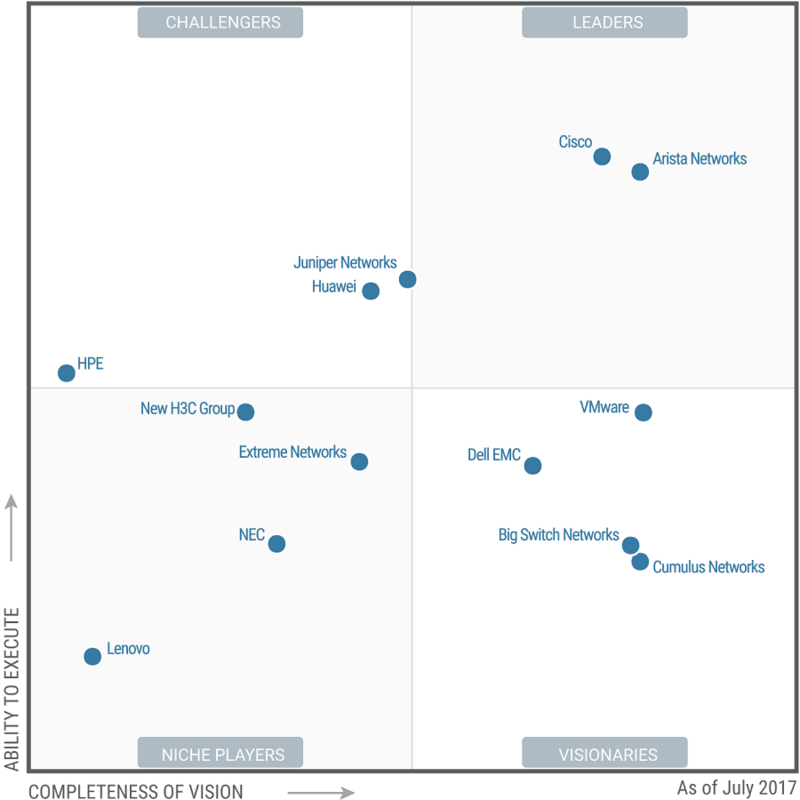 The "Magic Quadrant for Data Center Networking" report (available here from Big Switch Networks) is strewn with references to SDN. For example, here's what Gartner had to say about Arista Networks, the No. 1 company as positioned in the "Leaders" section of its quadrant: "Arista offers a flexible solution that can integrate with a wide range of third-party software orchestration and SDN products, through open interfaces and programmability." The rising importance of SDN is also reflected in the introductory section of the report, about market dynamics. In discussing the common topics that datacenter networking clients have raised in the past year, the No. 1 item was: "What is the status of software-defined networking (SDN)? Should I consider SDN?" Other companies besides Arista singled out for their SDN-related wares include Big Switch Networks, Juniper Networks, NEC and VMware. In addition to SDN, other new initiatives marked by Gartner include networking fabric solutions and intent-based networking. [Click on image for larger view.] 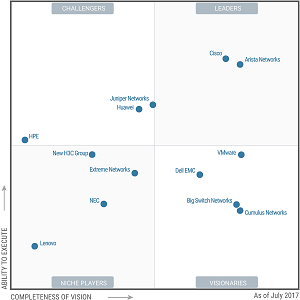 Magic Quadrant for Data Center Networking (source: Gartner). "Most vendors offer fabric solutions that are based on different (and generally proprietary) architectures, but can provide similar benefits as SDN, at least in terms of programmability and centralized point of control, if not in terms of reduced vendor lock-in and cost," Gartner said. "Examples are Cisco ACI and NFM, Arista Networks CloudVision, Juniper Networks Junos Fusion, and Huawei Cloud Fabric." The research firm noted that the combination of analytics and automation provide the foundation for intent-based networking, which Gartner referred to as "a concept that represents the next frontier for vendors." In fact, Gartner said, "With intent-based networking, high-level business policies are translated into network configuration commands and implemented through automation. Real network behavior is then compared against the desired behavior to enable any necessary remediation and ensure that the policy is actually enforced. The idea is to build a self-driving network. Just like building a self-driving car, implementation of intent-based networking systems requires data from sensors (network analytics) to feed the computation of abstract models built with complex artificial intelligence algorithms, and then actuators to operate the car." Cisco -- the only other company joining Arista as a "Leader" -- has agreed with Gartner's characterization of intent-based networking, recently proclaiming the approach as the future of the industry as the company shifts from hardware-centric to software-driven networking. 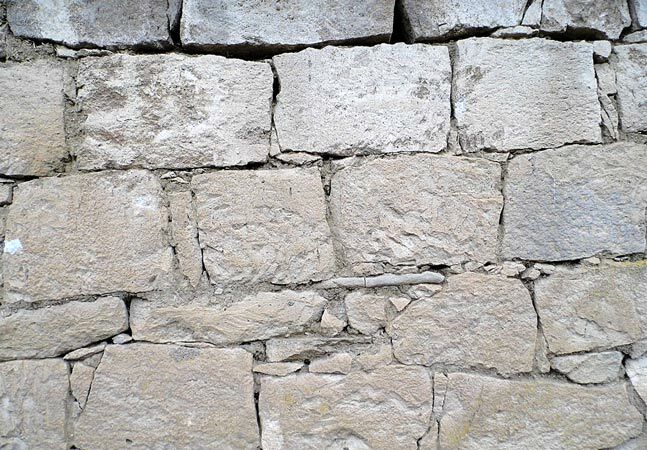 In the Gartner report, Cisco was noted for its ACI solution, which some industry observers say was offered as an alternative to SDN by the old-guard networking leader with the most to lose in an SDN-powered industry disruption. "Cisco's ACI software provides fabric automation, policy-based orchestration and service chaining capability, and supports integration with dozens of Layer 4 to Layer 7 networking partners, including Citrix, F5, Check Point and Infoblox," Gartner said. The industry is moving away from using device-by-device command line interface (CLI)-driven configurations toward a centralized and more policy-based mode of operations via APIs. Most vendors are now focusing their innovation efforts on software and leveraging merchant silicon to build their switching portfolio. 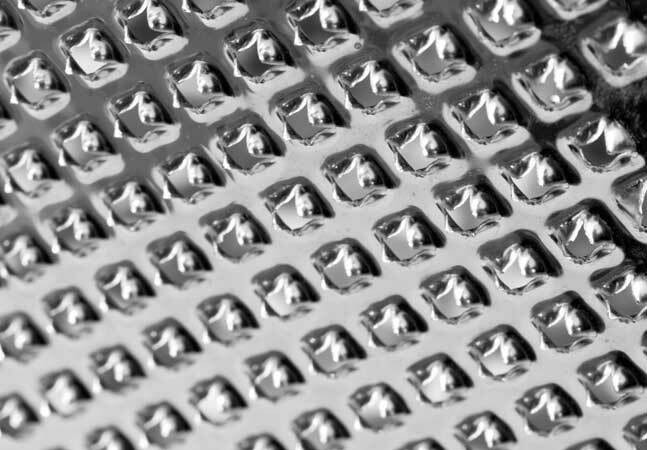 There is a growing willingness to move away from proprietary solutions to open networking. Disaggregation of hardware and software can be seen as a first step toward more vendor independence. Container networking is at the maturity stage where VM networking was about five years ago; it is fast-evolving and fragmented, with all vendors in this research starting to provide solutions and launching initiatives. 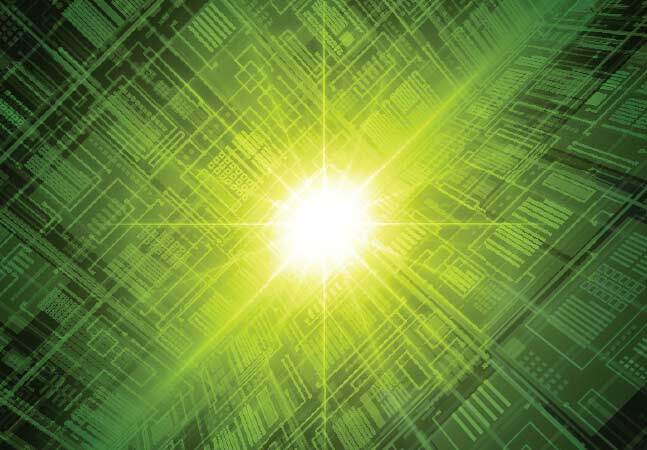 Hyperconverged integrated systems (HCIS), which tightly couple compute, network and storage hardware in a system -- are gaining popularity because they simplify operations and improve provisioning times. 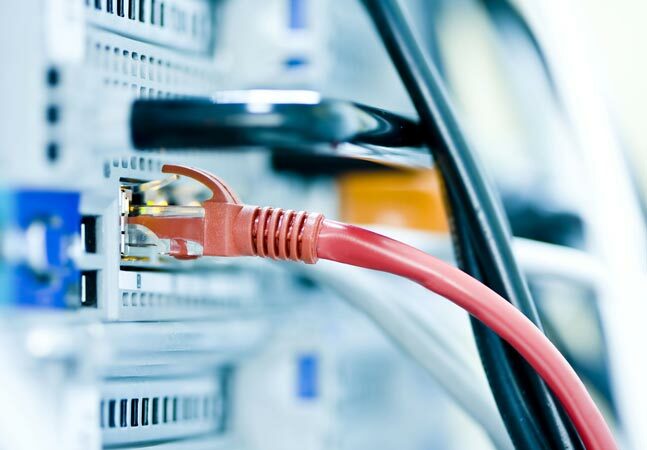 "What is driving change in data center infrastructures is the need for improved operational agility, a key requirement as clients go through the digital transformation of their businesses," Gartner said. "Vendors are evolving the features of their solutions in response to this pressure, but the biggest changes since the previous edition of this Magic Quadrant are related to the vendor landscape. It is essential for clients to understand the strategic market position of all vendors, in addition to the technical attributes of their solutions, to ensure that they do not put themselves on a dead end."